Testosterone BoostersOlimp ZMA - 120 kaps. 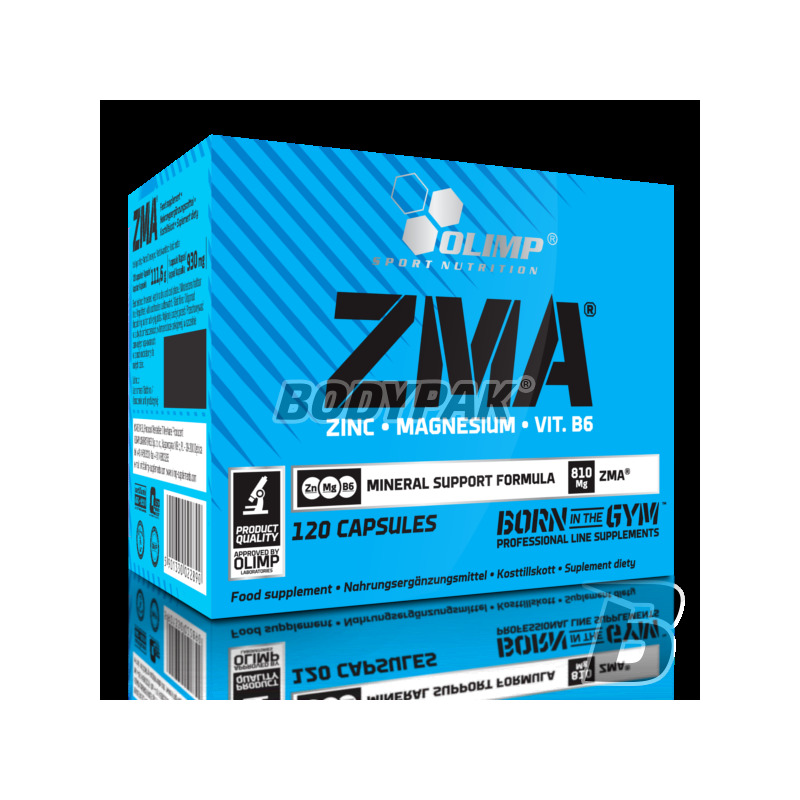 Olimp ZMA - 120 kaps. High-quality preparation containing a unique composition of elements: zinc, magnesium and vitamin B6. 144 loyalty points Your cart will total 144 points that can be converted into a voucher of 5,76 PLN. 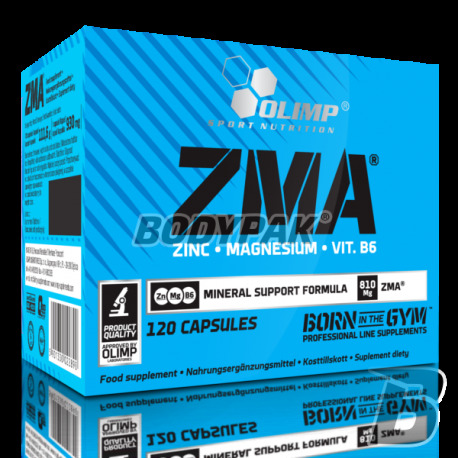 OLIMP ZMA TM is a product containing a unique formula elements: zinc, magnesium and vitamin B6. It is a natural steroidal anabolic - antioxidant formula. Individual substances included in the preparation are essential for everyday protection of the body from the harmful effects of overloads, associated with intense exercise, lack of appetite, disease and injury, and the so-called. oxidative stress. OLIMP ZMA TM increases the level and activity of testosterone, increases the level of IGF-I and leptin, which are responsible for the better use of energy, increasing the capacity and strength of the body. It reduces protein catabolism, supports the growth of muscle mass, prevents muscle spasms, relieves pain associated with overtraining. Counteracts the burdensome effects of overtraining, it supports regeneration of the body, prevents the occurrence of oxidative stress. In addition, it increases concentration and contributes to deep, restful sleep. The demand for elements and vitamin B6 included in OLIMP ZMA TM increases with increased physical activity. Men 3 capsules a day, women 2 capsules a day, 30 - 60 min. bedtime or otherwise, after consultation with the doctor. Składniki: 87,4% ZMA® (siarczan mono-L-metioniny cynku (L-OptiZink®), asparaginian cynku, cytrynian magnezu, tlenek magnezu, chlorowodorek pirydoksyny – wit.B6), substancja przeciwzbrylająca - sole magnezowe kwasów tłuszczowych, kapsułka (składnik otoczki - żelatyna, barwnik: E 171). 2 kapsułki ZMA przed snem i rano czułem się dużo bardziej wypoczęty niż wcześnie. Sen jest głębszy więc regeneracja na plus. Polecam każdemu. Odpowiedni produkt poprawiający regeneracje. Mógłby być troche tańszy, ale ważne że jest skuteczny! Bardzo drogie jak na ZMA, ale jeśli ktoś ma problemy ze snem, tak jak ja, to ten produkt jest dla niego idealny! Bardzo pozytywnie wpływa na regeneracje podczas snu - polecam! Świetnie przyswajalne ZMA - budzę się na prawdę wypoczęty, świetny preparat!